But let us not think of these things. At all costs we must maintain patriotic unanimity, the idea that our boys are selflessly serving America. Actually they do it because they have no choice. Offer them a chance to come home without penalty and see what happens. To make them fight we have heavy punishments for desertion, for treason, and for mutiny. Escape comes quickly to the minds of men compelled to die in wars that mean nothing to them in remote countries that mean less. Escape must be prevented. Thus the cries of “Traitor!” and “Coward!” The pack instinct runs strong, but self-preservation runs stronger. It must be suppressed ruthlessly. Flags whipping in the wind, thump-thump-thump, brass band, Stars and Stripes Forever, maybe a few F-16s howling overhead to set hearts a-pounding, unity. Politicians will speak of gratitude to our boys. Except of course that there is no unity, and few are grateful. Most of the country isn”t interested in the wars. The majority doesn”t know where Afghanistan is. The wealthy, the Ivy League students en route to careers in I-banking, and for that matter most college kids, have never seen a military base and don”t want to. The small-town, lower-middle-class South and West”the suckers grow thick there. Yale has never heard of Farmville. And doesn”t want to, and won”t. There is another reason why veterans rage at any deviation from the tales of nobility and sacrifice. Two choices exist for a man who has been mutilated in the hobbyist wars of Washington’s neocon pansies. He can believe desperately that he became a lifelong cripple in a worthy cause. God. Duty. Country. He can believe that he is appreciated. He can hope, or pray, that it was somehow worth it. Men engaged in killing for petroleum can develop a suspicion that what they do is just wrong. Soldiers are trained, conditioned by experts, to do things that the civilized find abhorrent. If a man begins to doubt the justness of the war, then he becomes no more than a hired murderer. This is not pleasant. Thus no one must be permitted to say it. A contagion might result. God forbid that soldiers begin to think. Independence of mind is dangerous to militaries. Training is chiefly a means of preventing it. Infrequently a soldier has the courage to see that what he is doing is both stupid and immoral, and walk away from it. 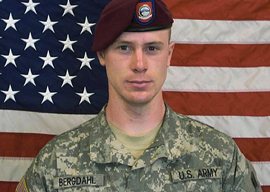 Bowe Bergdahl did. I say, speaking as a former Marine in Vietnam, and as a life member of both the Veterans of Foreign Wars and the Disabled American Veterans: You have my admiration, Sergeant Bergdahl.